>> 209 teams have used 20 or more starts. >> 22 teams have used 12 or fewer starts. >> 23 teams have made 0 moves. >> 25 teams have made 1 move. He's done 97 moves already? C'mon! 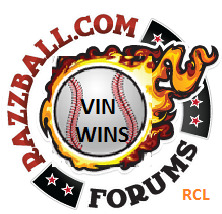 I am enjoying this league (helps to be in first place ) and Vin these recaps and this entire Forum are awesome! Great Job! Thanks, Ryan. Glad you're enjoying the recaps. Good luck the rest of the way. >> 166 teams have used 35 or more starts. >> 18 teams have used 21 or fewer starts. >> 2 teams have made 100+ moves. >> 91 teams have made 26 - 99 moves. >> 267 teams have made 10 - 25 moves. >> 190 teams have made 2 - 9 moves. >> 10 teams have made 1 move. >> 16 teams have made 0 moves. >> 153 teams have used 45 or more starts. >> 30 teams have used 29 or fewer starts. >> 3 teams have made 100+ moves. >> 130 teams have made 26 - 99 moves. >> 278 teams have made 10 - 25 moves. >> 144 teams have made 2 - 9 moves. >> 6 teams have made 1 move. >> 15 teams have made 0 moves. >> 242 teams have used 50 or more starts. >> 25 teams have used 35 or fewer starts. >> 171 teams have made 26 - 99 moves. >> 268 teams have made 10 - 25 moves. >> 115 teams have made 2 - 9 moves. >> 5 teams have made 1 move. >> 204 teams have used 60 or more starts. >> 21 teams have used 40 or fewer starts. >> 6 teams have made 100+ moves. >> 213 teams have made 26 - 99 moves. >> 239 teams have made 10 - 25 moves. >> 101 teams have made 2 - 9 moves. >> 3 teams have made 1 move.